The Roman galea (helmet) evolved over time. Click on image for full-size view. The first example of this helmet was uncovered in a Celtic burial in Montefortino, Italy, with similar types found in Spain and Gaul. In use from 300 BC to the 1st century AD with continuing modifications. 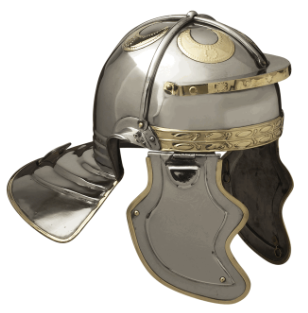 Montefortino helmets have a conical shape with a raised central knob, and a protruding neck guard as well as cheek plates to protect the sides of the head. Surviving examples often have missing cheek pieces, which may have been leather. Romans sometimes inscribed their names on their helmets. Early helmets are decorated with a "rope"-type pattern around the edge, and "pinecone"-type patterning on the crest knob. 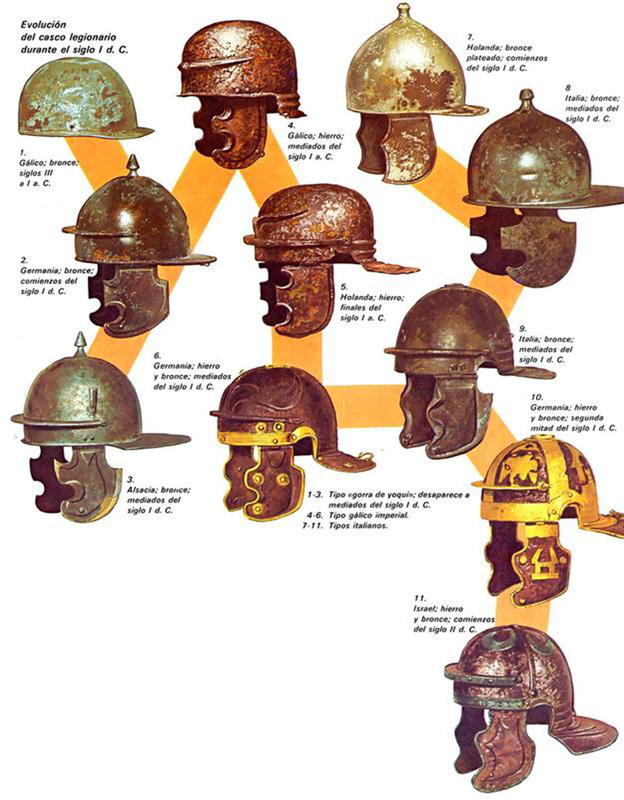 From the period of the Marian reforms of 100 BC, simple, cheap, undecorated but effective helmets were mass-produced for the mainly poor legionaries. 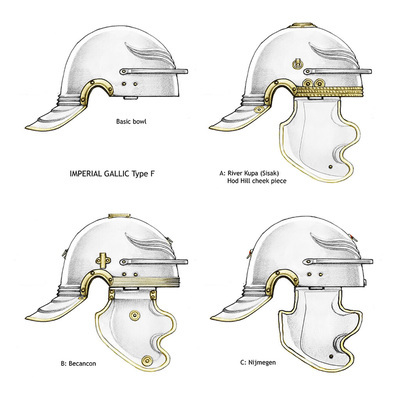 Imperial Gallic helmets, first made by Celtic craftsmen in Gaul, have a pair of distinctive embossed eyebrows on the forehead region and tend to be carefully made and elaborately decorated. 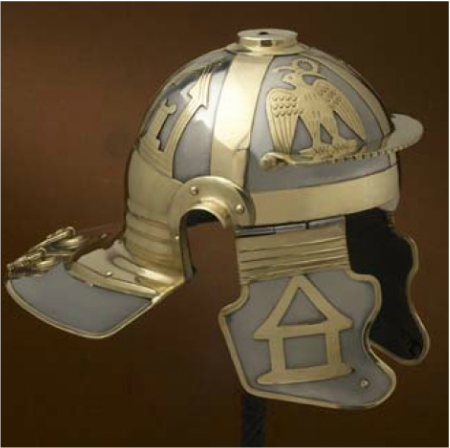 They have a sloped neck guard with ribbing at the nape, projecting ear guards, brass trim and decorative bosses. 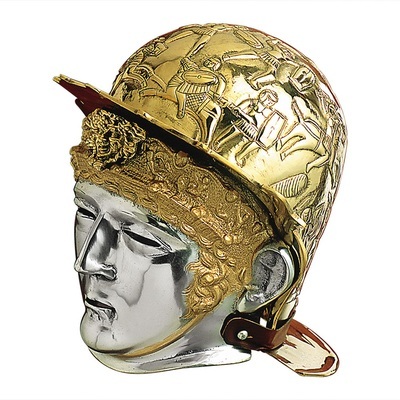 Imperial Italic helmets lack eyebrows and were roughly made, although improved over time. 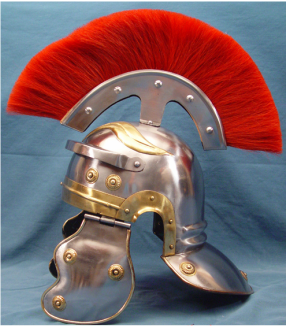 The wars of Trajan (AD 98-117) saw the wicked Dacian falx, a two-handed sickle-like sword, reach over Roman shield walls to puncture helmets. 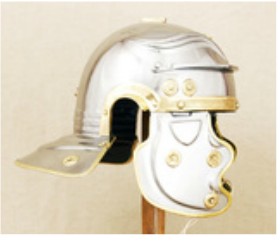 The Romans consequently added field-modifications of cross-bracing reinforcing bars to the helmet skull for extra protection. 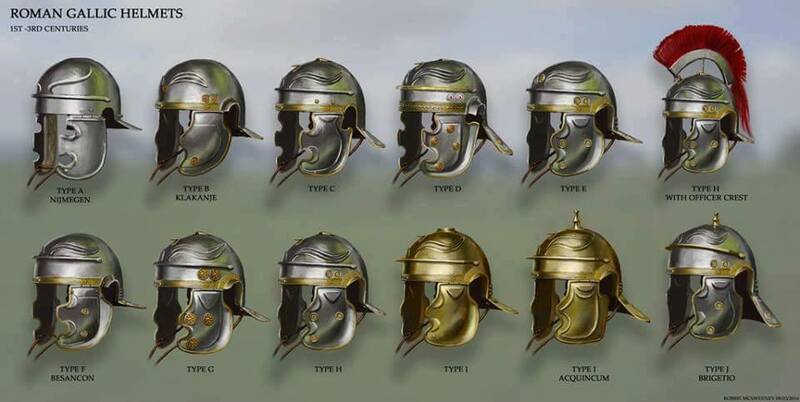 The crossbars became a standard feature of Roman helmets from 125 AD through the latter 3rd century. 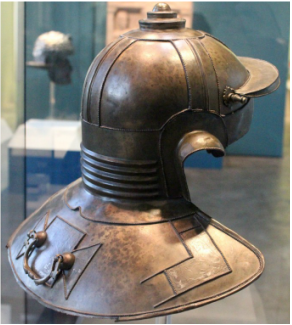 The Italic H Neidermormter helmet is made of iron or bronze, and is heavily decorated with a very deep neck guard. The cross bracing across the skull is embossed, rather than applied, with a dome-shaped knob at the crown. It is dated to the late Antonine or Severan eras, around 180-235 AD. 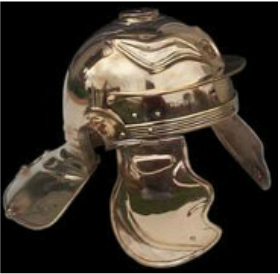 The so-called Roman "Trooper-helmet" offered on eBay and internet sites everywhere is not allowed. 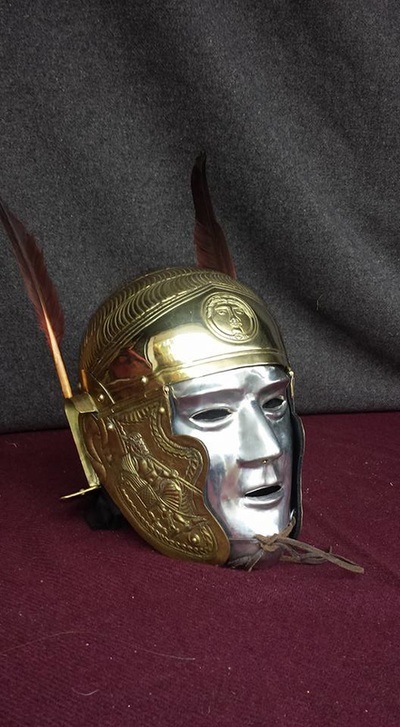 It is inaccurate with soldered-on eyebrows, lobster-tail neck-guard, wrong shape cheek-guards, and a permanently mounted crest. Please do not purchase it! 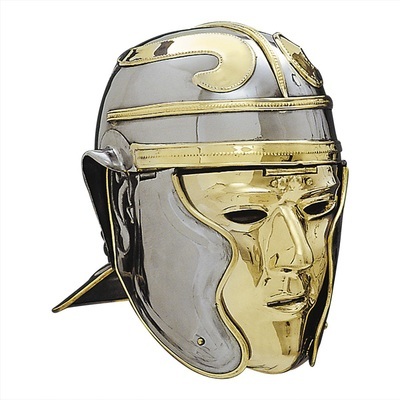 For the same price you can buy an accurate helmet that won’t cause the authenticity officer to smite you with his baton! 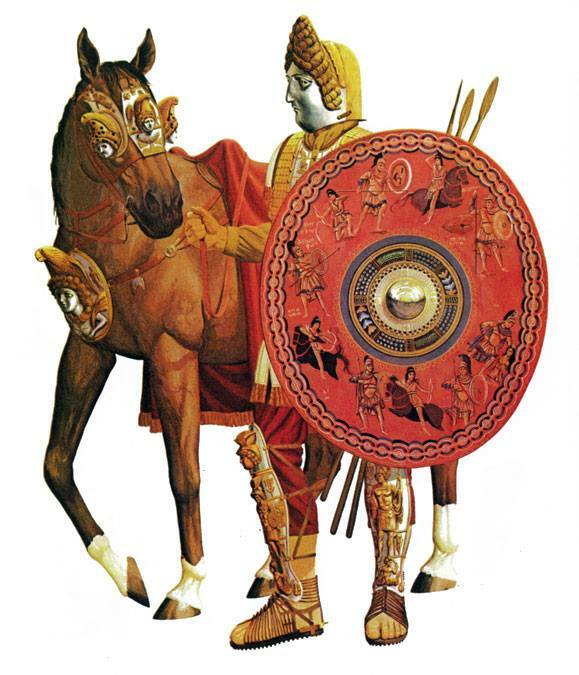 Crests can be worn on parade, along with cloaks, but generally not in combat where they can interfere with our shields in vallum and testudo formations. Crests are not shown on Trajan’s Column, but they are seen on Antonine monuments and the Column of Marcus Aurelius. ​They can be tied with leather thong or wired. 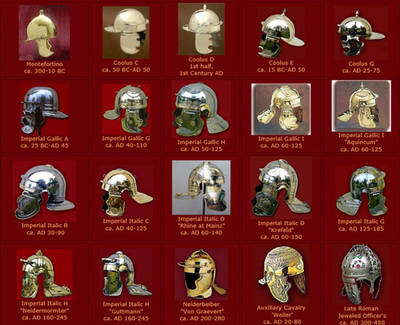 Below: Roman cavalry helmets with face-plates. 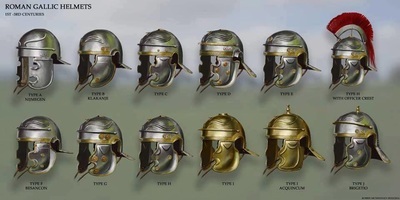 All three types are Imperium-Romana club helmets.